FYZICAL Therapy & Balance Centers is committed to providing innovative products and services that help to improve our patients’ mobility and health. We are proud to offer the latest technology in rehabilitation and training to the North Atlanta metropolitan area. The AlterG Anti-Gravity Treadmill provides patients and athletes an option unlike any other. Click here to see how the AlterG Anti-Gravity Treadmill is helping patients of all backgrounds and ages achieve their health and fitness goals. Rehab and train with less pain and impact and reduced stress on joints and muscles. The world’s best athletes and sports teams train and rehab with the AlterG including 24 NFL, 24 NBA, and 13 MLB teams along with 91 Universities and 4 US Olympic Training Centers. Click here to watch the Director of Sports Medicine and Head Football Athletic Trainer at the University of Alabama discuss the benefits of the AlterG Anti-Gravity Treadmill for their athletes. We offer the use of the AlterG to our patients as well as athletes and fitness enthusiasts. 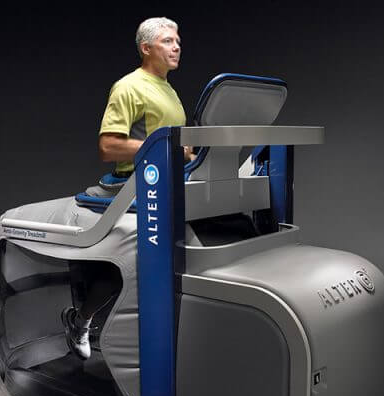 Approved by the FDA as a medical device, the AlterG is a high-tech treadmill developed by NASA. It uses a differential air pressure regulation system, which surrounds the user and lifts them up to reduce ground reaction and lower quarter impact forces during weight bearing exercise. The AlterG can reduce the weight of the user by as much as 80% (in precise 1% increments). People who use the AlterG say that it is like “running on air.